A warm, undead welcome to Nix Sidhe, who is an amazingly talented artist running her own Etsy shop and selling customizable zombie plush handmade to look like you and your loved ones! How did you and I meet? We met at IUP, through the steps of Leonard Hall. A unsightly gang of rag tag punk rock kids all hanging out in the sun. It couldn't have been more perfect. I think we should also mention that we lived together for awhile. You were a roommate and friend during one of my most interesting life phases: college. You inspired me as a strong, creative woman back then as you still do now. What is the most important thing we should know about you? I love myself. It's not always been easy and people haven't always been supportive but I live with my choices, accept my perceived short comings, and try to better myself and help others love themselves too. I share my space and my heart with my boyfriend, Corey. I also have my dear siblings and immediate family and a few lovely friends. It's the perfect life! You inspire me because of your business making Zomb-mes. Can you tell us about that? My mother had bought me a sewing machine as a gift after I had dabbled in sewing when I taught art at a Girl Scout summer camp in Virginia one summer. I'm self taught completely and after toying with making bags, iPod cases, and skirts I knew I wanted to make a plush doll. 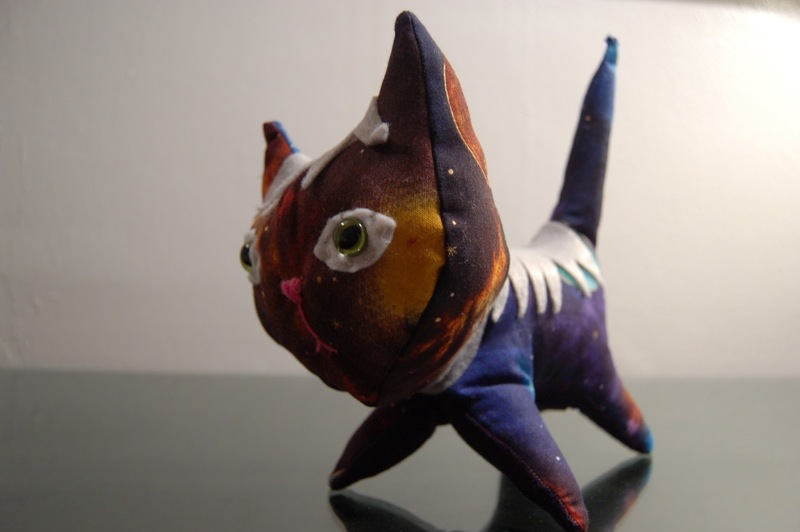 The first machine made plush was from a pattern from Wee Wonderfuls. Ah, I recognize Pointy Cat! I love the material you used! I made a plush from there, too, but it was Wee Bunny and unlike you, my efforts stopped there. What did you sew next? 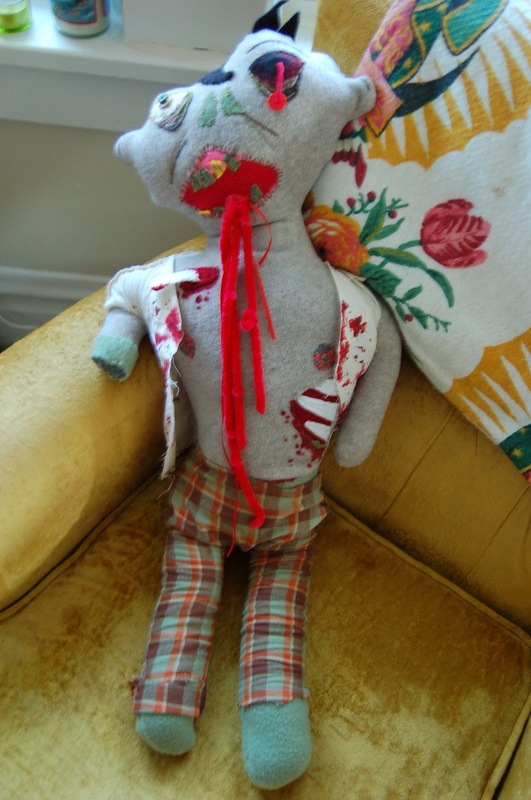 I then progressed to an obvious choice, a zombie themed plush. This plump undead beasty had no name and was a mix between hand sewn and machine sewn. The next step was Zed, a true zombie. The very first Zomb-me and the prototype I started to refine to get the Zomb-mes to where they are now. The first true Zomb-me was the mail order Zomb-me. From there the creatures took off with the ability to customize them. What was Plight of the Living Dead like when it started? How has it evolved to what it is now? My store had a meager start. I sold a lot of handmade things; greeting cards, purses, little pillows with embroideries on them, etc. 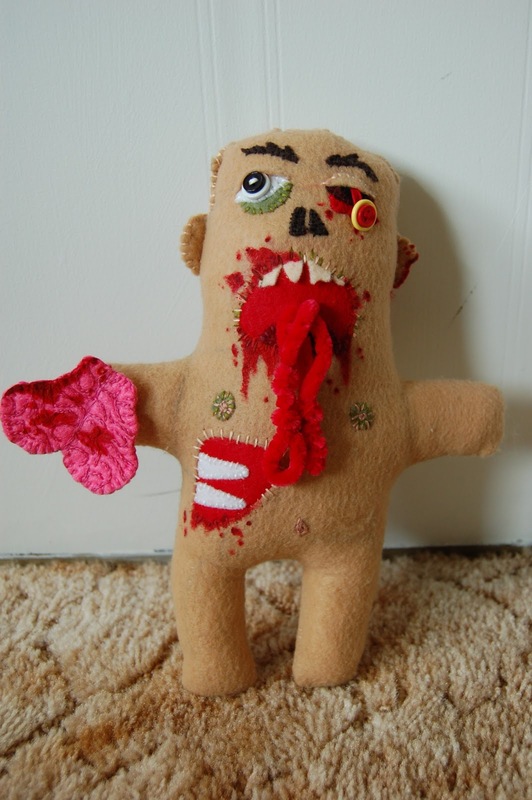 It wasn't until people on Flickr.com showed real interest in the zombie plush. The ability to customized the plush really appeals to people, knowing they can order a Zomb-me to look like their son, daughter, husband, wife, etc. Right now, in my sewing I'm having issues with mass production while maintaining the unique look and handmade feel of the Zomb-mes. I've been trying out a few different small changes in the process to speed it up a little bit. Ideally, where do you see your creative work in 5 years? How do you plan to accomplish this? The future of Plight of the Living Dead is evolving. I still work a 40 hour a week job which takes up a lot of my time so for now it's a lot of balance. I'd like to see in 5 years this undead enterprise to be my main source of income. I'm working on some ways to streamline the process right now. Whether that means changing the actual sewing process or change the look of the plush its uncertain. I just want to be able to make these Zomb-mes available to more people. Everyone needs a Zomb-me of their own! I totally agree! I can picture how adorable our whole family in Zomb-mes would look sitting on our couch! I'll just have to wait until the kids are old enough to truly appreciate the uniqueness of them and, you know, hopefully by then they won't be terrified by seeing Mommy and Daddy's guts spilling out of their clothes in plush form. What inspires you about creating handmade items? I love the feeling of making something out of nothing. The fact that I can create something tangible from the thoughts inside my head makes me feel so good. Then knowing that thing can make someone else that happy is so fulfilling! Yes, your feedback speaks for itself! Customers are truly thrilled when their Zomb-mes arrive in the mail! What advice can you give our readers in the field of your expertise? Never stop. Learn more. I taught myself embroidery and sewing and there is always more to learn. New techniques, classic traditional styles. Read everything you can about what you love and try not to get too frustrated when you make mistakes, it happens to everyone and remember to learn from them. That's great advice for EVERYone, including children. It makes me think of Mister Rogers who was an inspiration to both of us. I remember being with you the day we found out he had died. It's beautiful to see his principles live on through you! Who are some women that you admire and why? Ohhh! I love this question! Haha. I really love Peaches because she's so bold and in your face and never backs down from who she is. I also admire the writer Inga Musico, she's a feminist who writes these really inspirational sociology books. Lastly I think Julia Wertz is amazing. She's a comic artist and has a great sense of humor. I'll have to dig further into her comics because her website is fabulously funny! Thank you for sharing her with me. What are your other passions? I love being outside. Summer days spent in the sun and long warm nights. I like to read too, when I have the time. A lot of classic literature and non fiction. Although I always suggest people read The Mysteries of Pittsburgh, which is one of my all time favorites! Speaking of Pittsburgh, you and our former Show & Tell Feature, Addi, are both from the lovely city. You also both share the decision to be child free. This article was published recently by a mother who regrets having her children. Some readers found it appalling, but I think it's an honest reflection on a decision from her life, much like we might look back and wish we had chosen a different career. It is sad, for her, for her children, and because of the fact that society finds it so difficult to relate to women who know they don't want to be mothers. I think it is a very respectful decision since parenting is a huge financial, physical, and emotional investment. Would you mind discussing this with us? I think I sort of always knew I didn't want children. Even as a child myself I wasn't terribly interested in playing with dolls or pretending I had a baby. Then in my mid twenties I knew I wanted to have a tubal ligation. It took visits to many other doctors before I found one that would perform the surgery. I've had a lot of mixed reactions from people on it, including my family but I know I made the most responsible choice for me. Where can readers find you to learn more (IRL and social media)? Well in the real world I live in Pittsburgh, the most wonderful city! I actually don't have a huge social media presence anymore. I've found in my thirties my time is so precious and the less time I spend online the better! I do have my Etsy, my personal blog, my craft blog, and a Flickr.